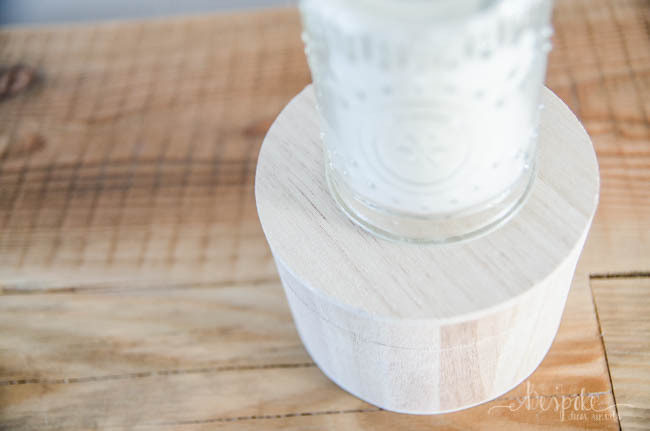 Today we’re bringing a simple but elegant DIY your way. 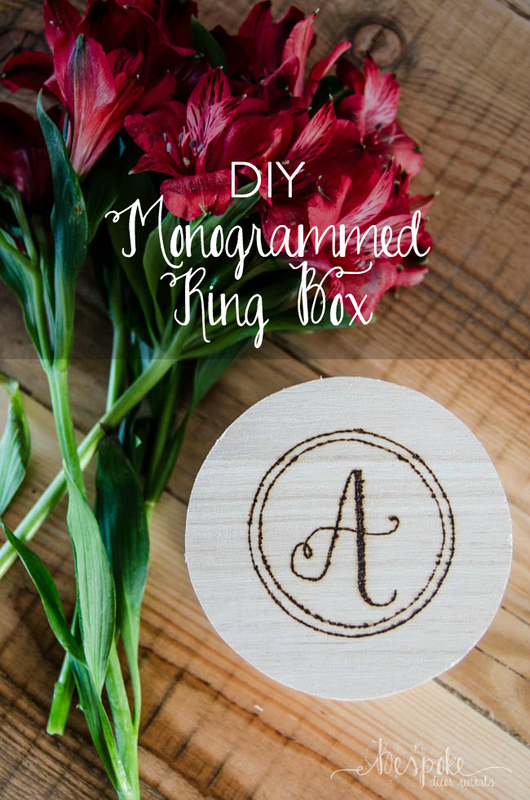 This DIY Monogrammed Ring Box is so simple, the aesthetic could fit almost any decor theme. 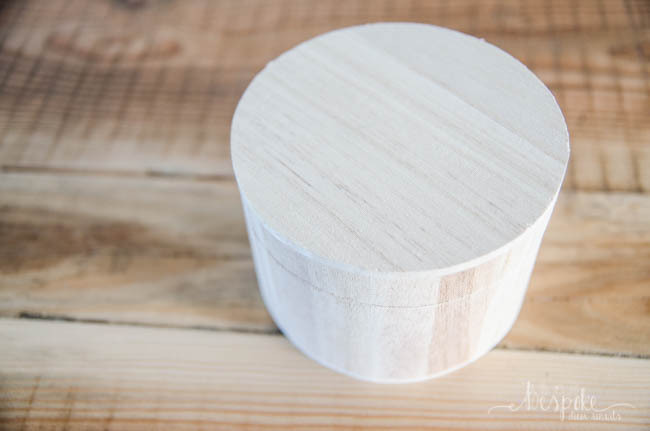 We love the clean round shape with no latches (just a hidden magnet!) 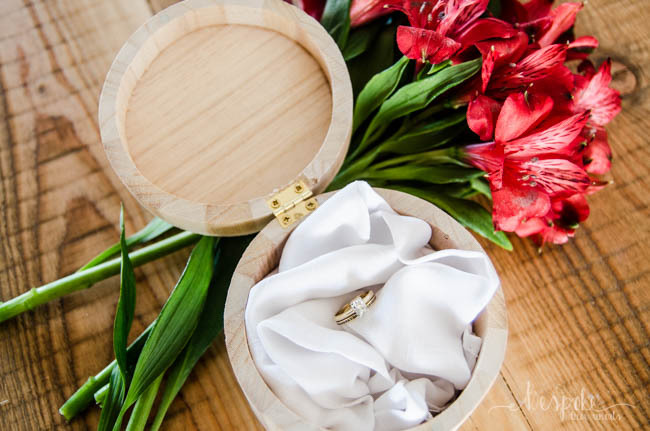 of these boxes that are the perfect size to be carried down the aisle in little ones’ hands. If you’re looking to do something a little different than a traditional ring pillow… maybe this is your answer! 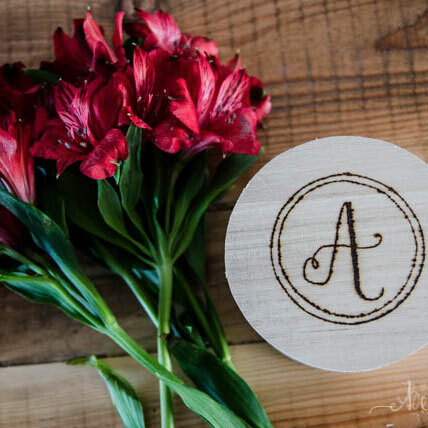 We chose to do a simple one letter monogram inside two clean circles, but you could totally choose to dress it up with some flourishes and garnishes. The sky is the limit! 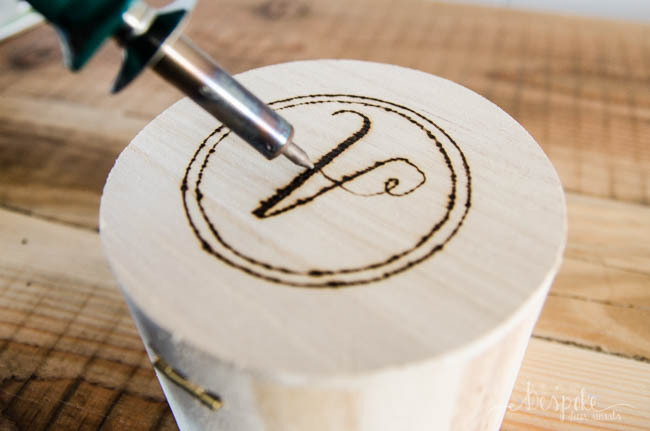 If you’ve never tried wood burning, it can seem a bit intimidating. I mean, the thing is hot enough to burn wood, right? But we dare you to try it out! It’s actually so simple. Think of it like writing with a hot pen. A very hot pen, but just a pen. The entire handle is cool, you just need to keep your little fingers away from the hot end (just like a glue gun). And is that really so scary? We picked up this box from Michaels, theres so many different shapes and sizes to choose from. The first thing you’ll want to do is decide on your design. 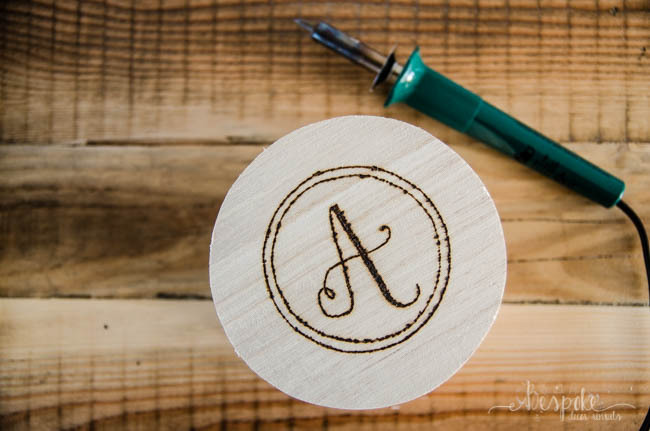 Sketch it out or print out a stencil to transfer to your box. Put on your round pointed tip for your wood burner and let it warm up while you’re doing this. We used a candle to trace around to get the circle shape. I don’t know about you but drawing a perfect circle isn’t my strength! We added a second circle inside that one before working on the ‘A’. To do a faux calligraphy letter, draw it as you normally would then add thickness to the ‘down’ strokes. That means any time your pen would be travelling towards the baseline, you should be making that stroke thicker. You could even add in a date on the bottom as a memento. There you have it! Easy as pie! We used some white linen to fill the box, but you could choose any material that matches your colours. What do you think of the simple raw wood look? 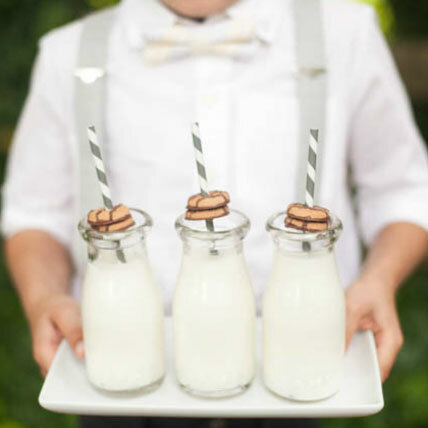 We cant help but picture it at a winter wedding full of fresh holiday greens! But maybe that’s just the season. If you follow this DIY we would LOVE to see photos! 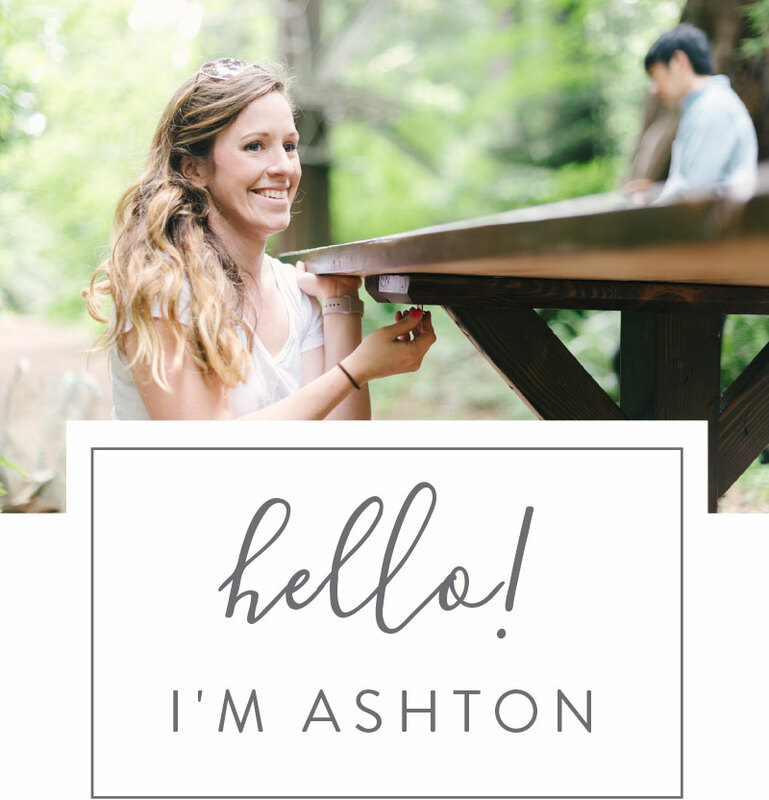 Welcome to month two of our ‘New and Wonderful’ series where we share some of our fresh inventory that is all ready to join you at your event. We have new inventory joining us all. the. time. 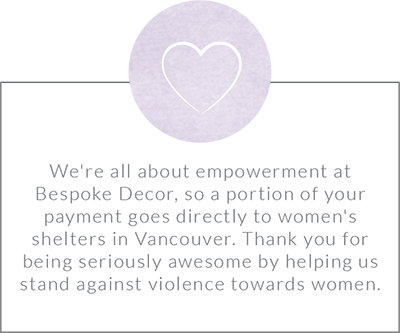 So we’re really just featuring something we especially love each month. 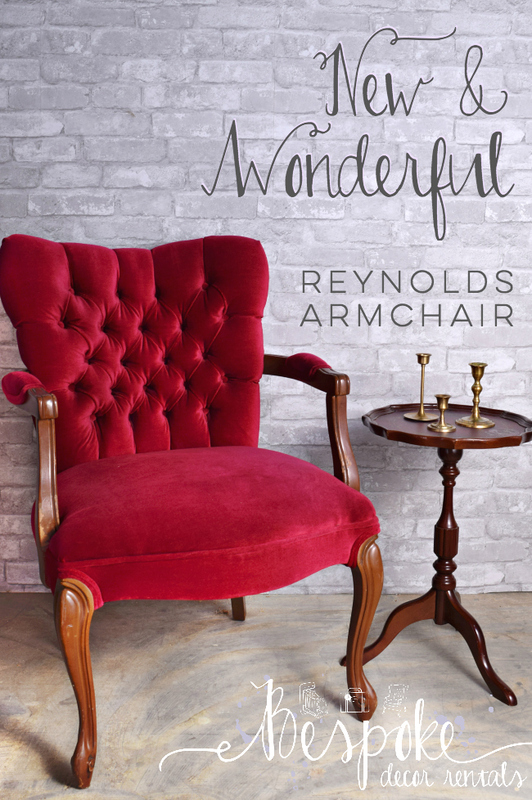 And for the second month in the row… it’s a stunning arm chair! There’s something about classic upholstery and luxe fabrics that get us every time. Meet Reynolds. Isn’t he charming? We especially love him headed into the holiday season. Did you spot our wreaths post last week? He’d look stunning paired with one IMHO. I think we may need to do a round up of our favourite ways to use upholstered arm chairs because there are SO many fabulous ways to make use of them in events… here’s a few of our faves: a signing table chair, a welcome vignette, a photo prop, in your getting ready room and photos, at the head table, in a comfy lounge area, in a man lounge (that’s a thing, really)… and honestly ANYWHERE you need a chair or some decor to spice up a corner. They’re so darn versatile and beautiful. Tell us, where have you spied upholstered armchairs being used in weddings, events, and decor? We always love some new inspiration, link it up in the comments! Every year we do this, Halloween passes and the holidays flood all of our inspiration feeds and we just. can’t. get. enough. Anyone with us? We’re loving it! One of the things we’ve spied and are loving the most? Holiday wreaths at weddings. Simple greenery, simple shape, big statement. 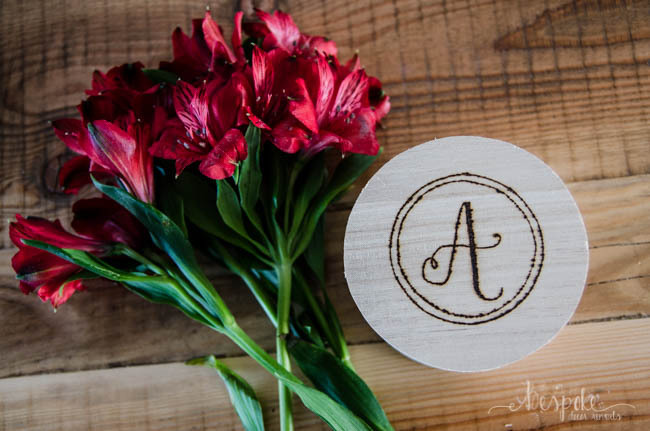 If you’re headed towards a winter wedding, would you consider adding wreaths to your decor? Here’s a few ways you could consider (we think might sway you to a ‘yes!’). ONE: How cute is this pooch! We’ve been spying wreaths on pets in weddings for a while, but are loving the wintery take on the trend. TWO: This one might be one of my favourite uses (which is why it’s in here twice! ), wreaths on the back of the bride and groom’s chair. We especially love the lettered signs topping these ones off! THREE: We had to include this one because of that sweet banner! You could have anything lettered on that baby and it would look incredible. Merry Christmas? Thank you? Just Married? Forever begins here? Whatever you choose, it’s a win guaranteed. FOUR: As promised, wreaths on chairs 2.0. But really, isn’t this the perfect use for them?! FIVE: Did we mention that they make a gorgeous photo prop? 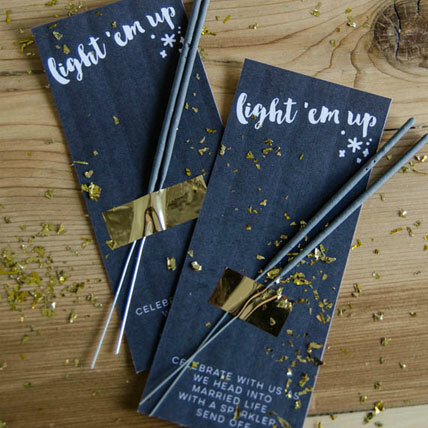 Hold one of these babies and you’ve completed your holiday card photo! SIX: This wedding is stunning top to bottom. We love that they decorated the heritage church with classic holiday wreaths– so simple but striking between those gorgeous windows! SEVEN: We know you’ve loved floral crowns, but how about a pine crown? Embrace the season! This one is a DIY and it’s SO lovely. 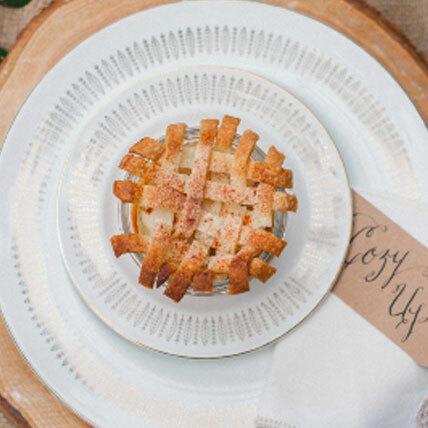 EIGHT: This whole wedding (actually the same as numero 2) just oozes cozy winter goodness. We love that she opted for a fur shrug and sleeves- way to embrace the season! NINE: Okay, okay. 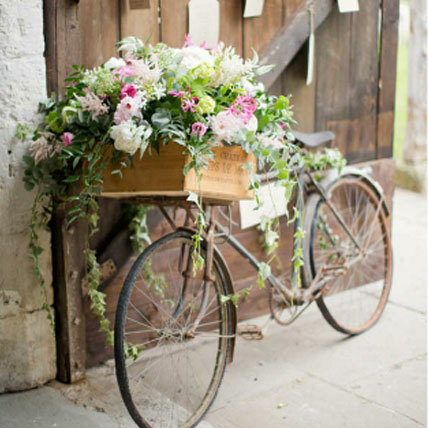 So this shot is actually from a spring wedding… but it was drop dead gorgeous so we couldn’t omit it. Is this wild wreath collection above the settee stunning!? I want one in my home now. It’s all kinds of wonderful. Tell us, what’s your fave? I’m still drooling over number nine. It is happening around here, I swear.